Bucatini all’Amatriciana is one of the holy three pasta sauces in Rome (also alla gricia and alla carbonara) based upon guanciale. 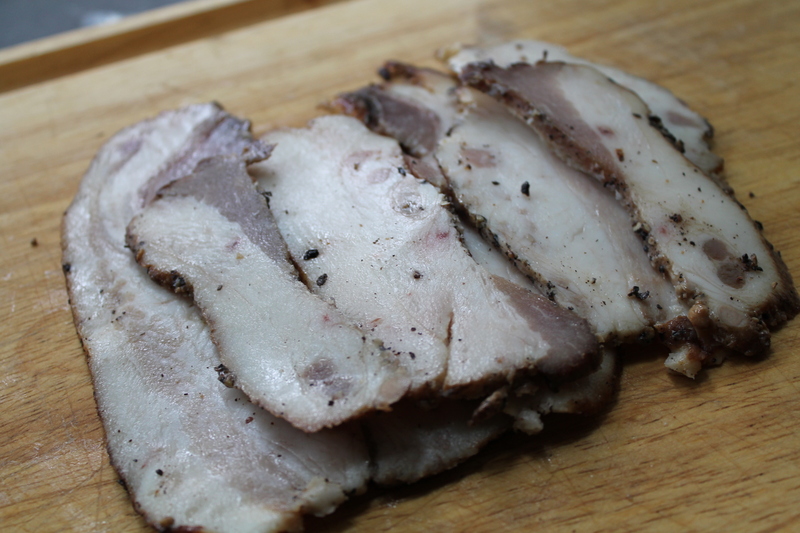 Guanciale is cured pig jowl, and though you might not have heard of it or eaten it, trust me that it is the very finest thing one can do with a pig. Yes, better than American bacon or even prosciutto (at least for me). The flavor is wonderfully rich and distinctly porky in a way unique to guanciale. People offer say to substitute pancetta in the states, but please don’t do that for this dish, especially since most pancetta available in the US is absolute junk. Real guanciale from domestic producer La Quercia can be purchased in New York from Eataly or Philadelphia from diBruno brothers. It freezes fine, so go out of your way to buy some and keep it for several months in the freezer, cutting off a little here and there as needed. If you can’t go to the trouble of obtaining guanciale, just don’t make this dish. There are other lovely things to eat. 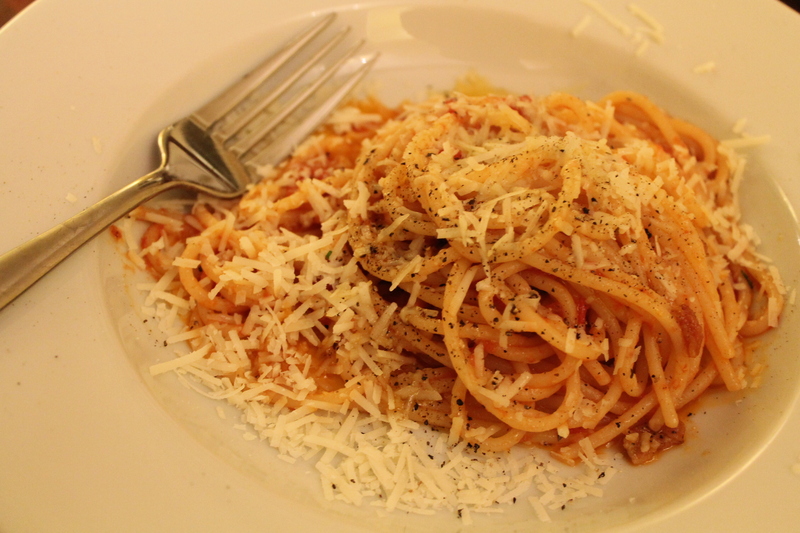 Though I have long made alla gricia and carbonara, Amatriciana had always troubled me a bit. After consulting numerous recipes, I just couldn’t get it to taste just right, like the best version in Rome from Arcangelo Dandini, which he uses to dress his heavenly potato gnocchi. But last week I was eating at Armando in Rome, and they were publicizing their new cookbook with a little pamphlet, and in the pamphlet was their recipe for amatriciana! I made it tonight, and though I might tweak it just a bit, it was better than my previous attempts, some of which included onion and too much tomato. Armando’s version keeps tomato to a minimum, uses wine, and uses no onion. Tonight I’m cooking for myself at Casa Sinibaldi in Rome, awaiting my new group of students to arrive tomorrow for a week of culinary and cultural immersion, and so here is Armando’s recipe for Amatriciana, scaled down for one! Most traditional is actually bucatini (thick, hollow spaghetti), but I prefer spaghetti, or better yet, small rigatoni since I have an idiosyncratic dislike for tomato sauces with spaghetti. Bring 4 quarts of water to a boil and properly season with 2 tablespoons salt. Add 50 grams pasta and cook about until al dente. 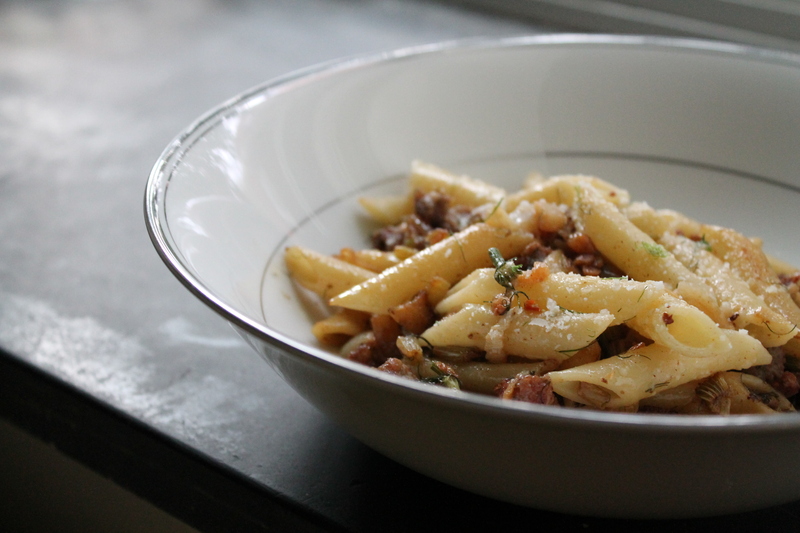 While the pasta is cooking, brown 10 grams of pancetta in a pan with a little olive oil, then remove from heat, remove the guanciale, and add a splash of white wine. Add 2 tablespoons tomatoes (fresh or high quality canned and crushed) and 1/8 teaspoon salt. Cook for about 5 minutes. 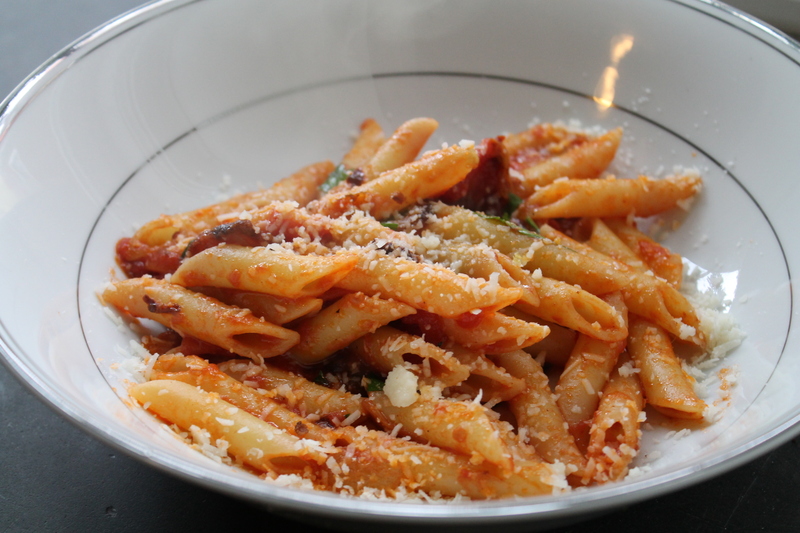 When the pasta is ready, drain and add it to the sauce along with the reserved guanciale. 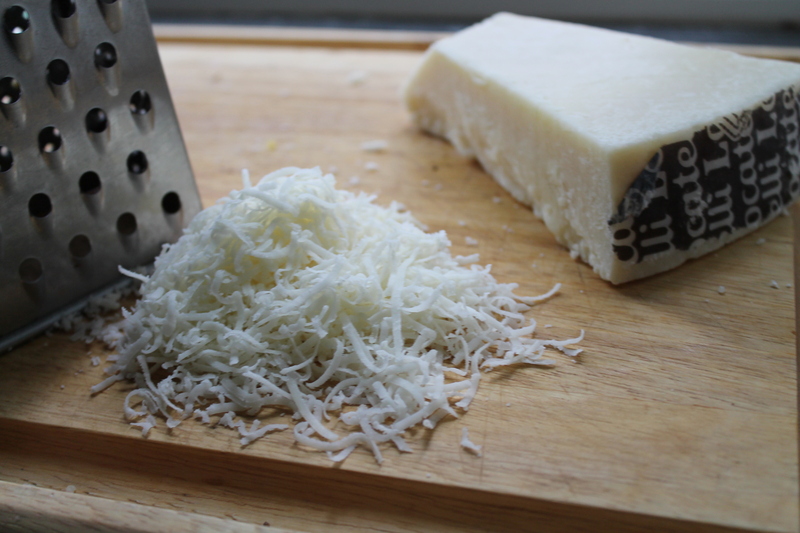 Add generous grindings of black pepper and about 10 grams grated high-quality imported pecorino romano cheese. 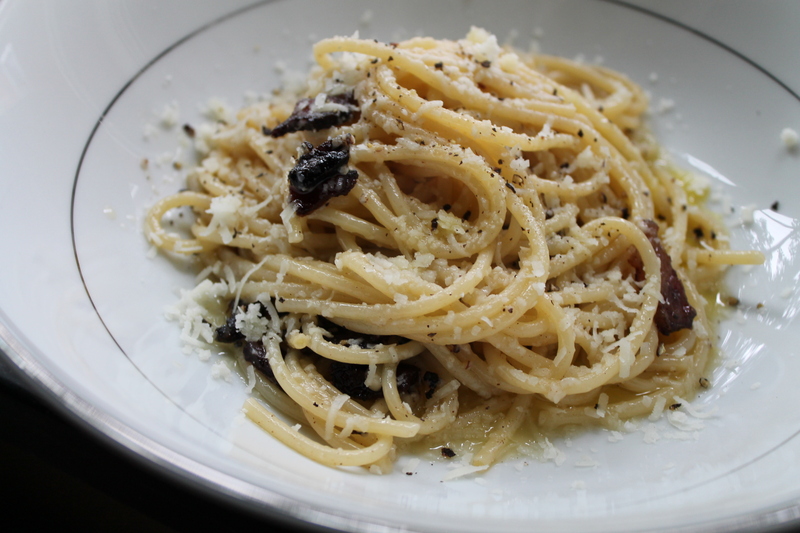 Plate and serve at once, with additional pecorino, black pepper, and olive oil. Note: Although Armando doesn’t use it, Marcella Hazan includes a little butter in her recipe, and I have a suspicion that Arcangelo might do the same, though I’m not sure. Although butter is not traditional in most Roman cooking, it’s worth a try. 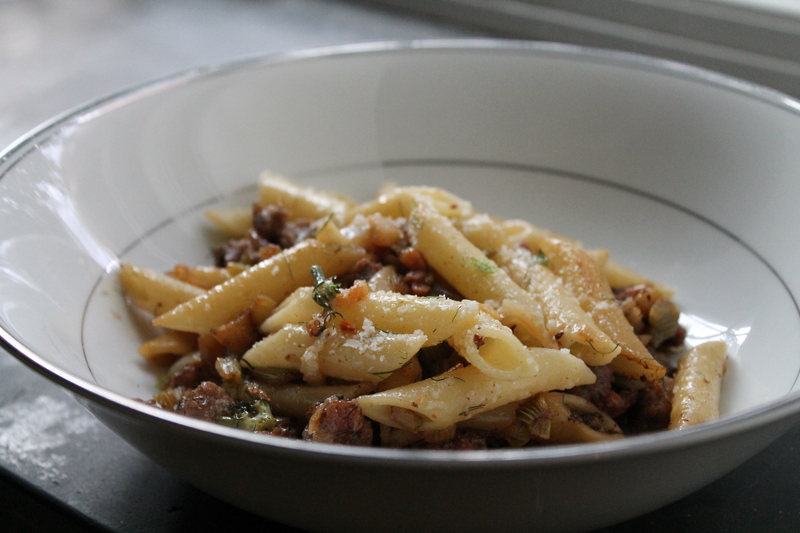 Some of my favorite pasta sauces are savory ones with sausage as a base. Sausage goes so well with everything: cream, broccoli raab, spinach, squash, fennel. I guess it goes well with just about everything. Making fresh sausage at home is really quite easy and so much better than store bought sausage with all its secret ingredients. I’ll post our recipes for making fresh sausage soon. For now, enjoy this recipe with sausage and bulb fennel, or finocchio in Italian. Though we’ve eaten finocchio for years, this summer is the first we grew it at the farm. It’s a lovely ingredient and quite under-appreciated. Make sure to select a bulb with some of the feathery fronds for garnish. You can take this recipe in two directions. 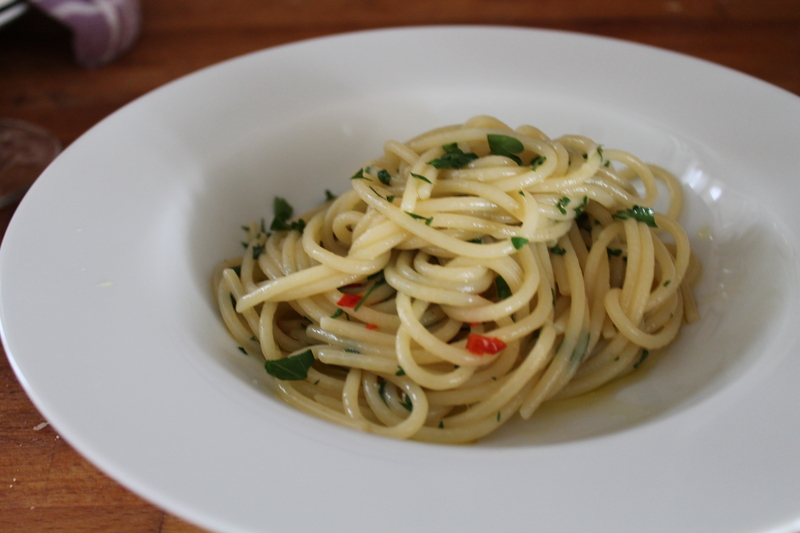 With butter and parmigiano or with olive oil and pecorino, in which case a little hot pepper is nice as well. Add tomatoes to the recipe, and you have something very similar to what Mario Batali serves at Lupa in Greenwich Village. 1) Bring 4 quarts of water to a boil and add 2 tablespoons salt. 2) Add 4 ounces penne or other tubular pasta and cook until al dente. 3) While the water is heating up, brown about 1 cup sausage or so (about 1/2 pound) in a generous bit of cooking fat (see above). If the sausage releases a lot of extra fat, pour some of it off. 4) Dice up half an onion and add it to the pan, stir to combine and lower the heat a bit. 5) Dice up about 1/2 fennel bulb (or a whole one if small), and add to the pan. Season with salt and pepper (either black or hot, see above). 6) Cook for around 10 minutes until the vegetables are tender and a little colored. 7) Add a little liquid (broth or pasta cooking water), deglaze, and remove from heat. 8) When the pasta is ready, drain and return the sauce to heat. 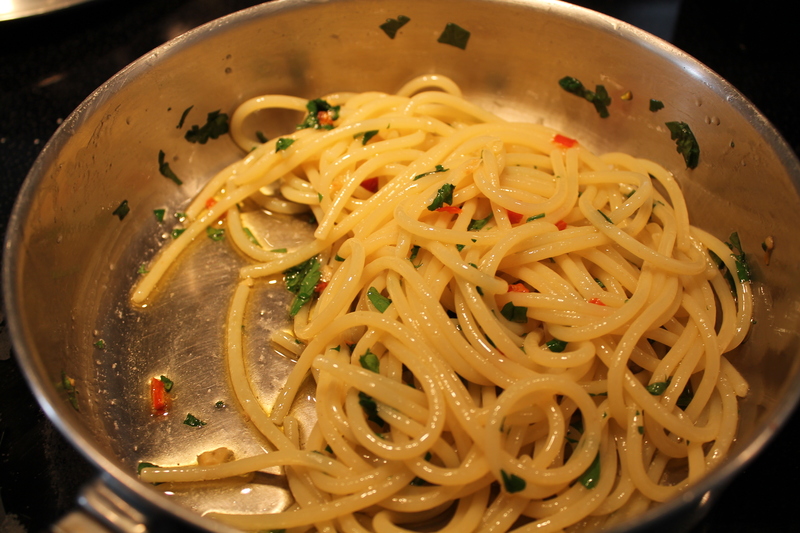 Add the pasta to the pan. Toss quickly but thoroughly and serve at once, garnished with freshly grated cheese and some chopped fennel fronds.